Hello, and thank you for taking the time to visit our website. We hope you find the information we provide valuable, and should you have any questions, please feel free to call our store at (314) 831-1551. If you decide you would like some help with your flooring project, please take advantage of our free shop at home service or come by our showroom. Classic Carpet & Flooring has joined the growing movement of supporting a green lifestyle. Many of our manufacturer’s offer green and environmental-friendly options and we try to act locally to support the same earth-friendly stance. 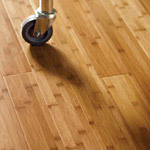 For instance, we offer bamboo and cork floors, which are both renewable sources of durable, comfortable flooring. Cork floors are made from the bark of cork trees. After the cork bark is harvested, the tree will regrow its bark, and be ready to harvest again in 9 years. Like cork, the bamboo plant can be repeatedly harvested (every six years), making it a replenishable resource. BR-111, one of our wood suppliers, uses a very earth-friendly system to harvest their products. Rather than clear-cutting forests or even part of forests, BR-111 instead will cut only one tree in a five from any given area. Then, to promote the well-being of the area, they re-plant new trees in areas they have harvested. Classic Carpet & Flooring is one of the first stores in the St. Louis area to recycle the carpet padding that we remove from our customers’ homes. The padding is shipped directly back to the padding manufacturer and turned into new product. We also sell “rebond” padding, which is made 100% from scrap and recycled foam, and happens to be the most durable cushion on the market. In addition, Shaw industries now recycles nylon carpet. This literally keeps tons of used carpeting from hitting the landfill, and helps reduce the amount of fuel and energy needed to produce new carpeting. 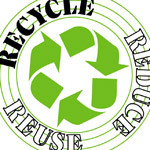 Completing the recycling circle, our store offers carpet and padding made from recycled materials. Ask about the new Natural Reflections carpet line from Shaw made with recycled nylon. 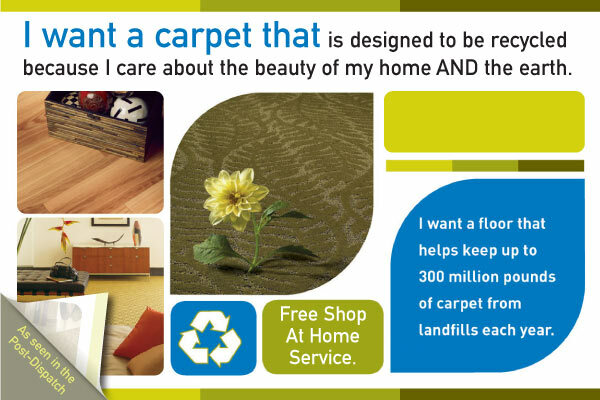 You can feel good about choosing a recyclable carpet that is made from reclaimed nylon fiber. As the number of products with recycled content grows, be sure to check out our Kathy Ireland line of carpets. These products “made for busy moms” feature the most advanced stain protection, and are recyclable. 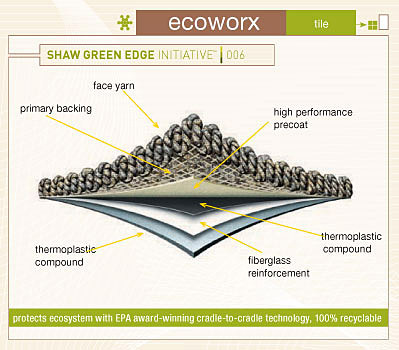 For our commercial customers, we offer carpets with the Shaw EcoWorx backing. It is a sustainable alternative to traditional PVC, and is superior in durability and value. EcoWorx backing offers cost and installation benefits, is lighter in weight, and is characterized by its unsurpassed tensile, tear and lamination strength. 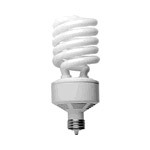 Ecoworx also contains 40% recycled content. Ecoworx products are backed by the industry’s only environmental guarantee for carpet backing—at the end of its useful life, we’ll pick up your EcoWorx (at no additional cost) so it can keep on working. What that means is your carpet tile doesn’t end up in a landfill—it gets cycled back into the manufacturing process to make more EcoWorx, again and again. For customers interested in decorating their home with an eye towards a “green” process, we have several options to help you. We hope you will give our store a try. Thank you.